Happy Friday, friends! It's been so long that we've shared a craft with you, I thought it was about time. 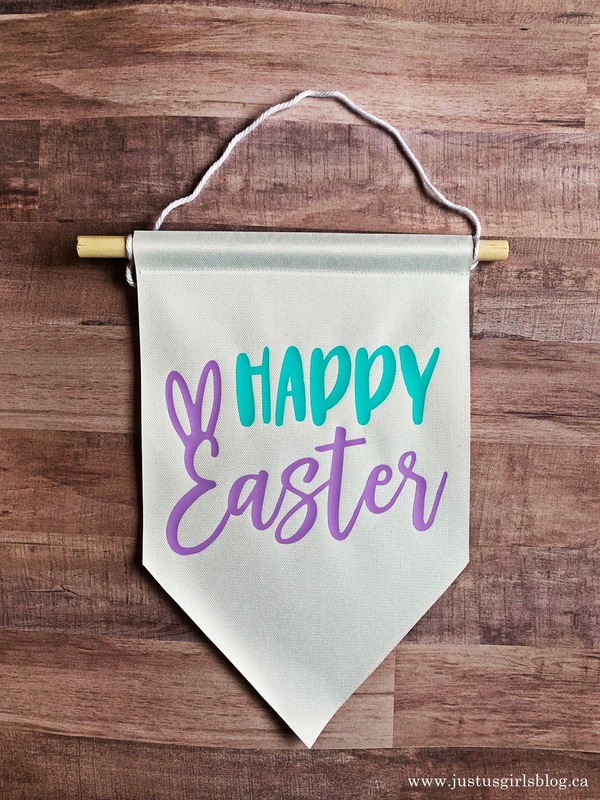 Since Easter is around the corner, what better way to craft then with something to celebrate the holiday coming up. This is a pretty easy and simple craft, especially if you have access to a vinyl cutter. I've been using my Silhouette Cameo for all the crafts ever since I got it for Christmas about four years ago and now that the blog is back in full action, I can't wait to share with you all the things you can create with a Silhouette Cameo. There is so much! As I said above, this is a pretty simple craft. All you need is the Easter Design that I created, along with a vinyl cutter, canvas material, an iron or heat press and HTV (Heat Transfer Vinyl). I wanted to use some fun Spring colours so I chose lilac and a light teal. I love how the colours compliment one another. Directions: Add the Happy Easter design into your silhouette cameo software or whatever vinyl cuter software you have. Make sure that you reverse the design when it's in the software so that when you cut it out, weed the design and flip it over to add to your blank canvas banner that it goes on correct. Add the wedded design to your blank canvas and either with an iron or heat press machine press down on the design. Make sure you have a vinyl protection sheet or towel between the design and the iron or heat press to protect the design. That's it, pretty easy. If you have a silhouette machine or vinyl machine, please leave a comment below and let me know. I'm looking forward to sharing some of my other designs and crafts I plan on making with my cameo. This banner is so darn cute! I love ears on Easter. Thanks for the tutorial. Thanks so much! If you decide to create one of your own, we would love to see it!